You can use this topic to learn how to install DCB in Windows Server 2016 or Windows 10. Following are the prerequisites for configuring and managing DCB. You can use the DCB commands from this guide in the following operating systems. The following operating systems include previous versions of DCB that are not compatible with the commands that are used in DCB documentation for Windows Server 2016 and Windows 10. Following is a list of hardware requirements for DCB. DCB-capable Ethernet network adapter(s) must be installed in computers that are providing Windows Server 2016 DCB. DCB-capable hardware switches must be deployed on your network. You can use the following sections to install DCB on a computer running Windows Server 2016. To perform these procedures, you must be a member of Administrators. You can use the following procedure to install DCB by using Windows PowerShell. On a computer running Windows Server 2016, click Start, then right-click the Windows PowerShell icon. A menu appears. In the menu, click More, and then click Run as administrator. If prompted, type the credentials for an account that has Administrator privileges on the computer. Windows PowerShell opens with Administrator privileges. You can use the following procedure to install DCB by using Server Manager. After you perform the first step in this procedure, the Before You Begin page of the Add Roles and Features Wizard is not displayed if you have previously selected Skip this page by default when the Add Roles and Features Wizard was run. If the Before You Begin page is not displayed, skip from step 1 to step 3. On DC1, in Server Manager, click Manage, and then click Add Roles and Features. The Add Roles and Features Wizard opens. In Before You Begin, click Next. In Select Installation Type, ensure that Role-Based or feature-based installation is selected, and then click Next. In Select destination server, ensure that Select a server from the server pool is selected. In Server Pool, ensure that the local computer is selected. Click Next. In Select features, in Features, click Data Center Bridging. A dialog box opens to ask if you want to add DCB required features. Click Add Features. In Select features, click Next. 7.In Confirm installation selections, click Install. The Installation progress page displays status during the installation process. After the message appears stating that installation succeeded, click Close. By default, kernel debuggers block NetQos. Regardless of the method that you used to install DCB, if you have a kernel debugger installed in the computer, you must configure the debugger to allow QoS to be enabled and configured by running the following command. You can perform the following procedure on a Windows 10 computer. To perform this procedure, you must be a member of Administrators. Click Start, then scroll down to and click Windows System. Click Control Panel. The Control Panel dialog box opens. In Control Panel, click View by, and then click either Large icons or Small icons. Click Programs and Features. The Programs and Features dialog box opens. In Programs and Features, in the left pane, click Turn Windows features on or off. The Windows Features dialog box opens. 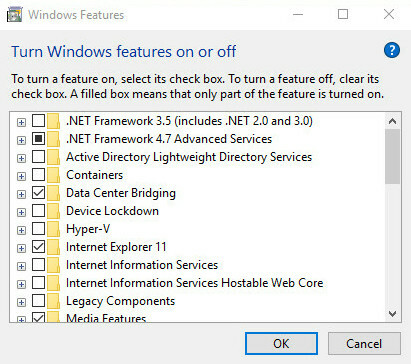 In Windows Features, click Data Center Bridging, and then click OK.